"Two days after Elvis Presley died, astronomer Jerry Ehman was sitting at his kitchen table, poring over an eye-straining thicket of numbers and letters on computer printouts. ... Ehman had volunteered to look for interesting patterns in this messy mass of data, which had been collected by Ohio State University's Big Ear radio telescope. 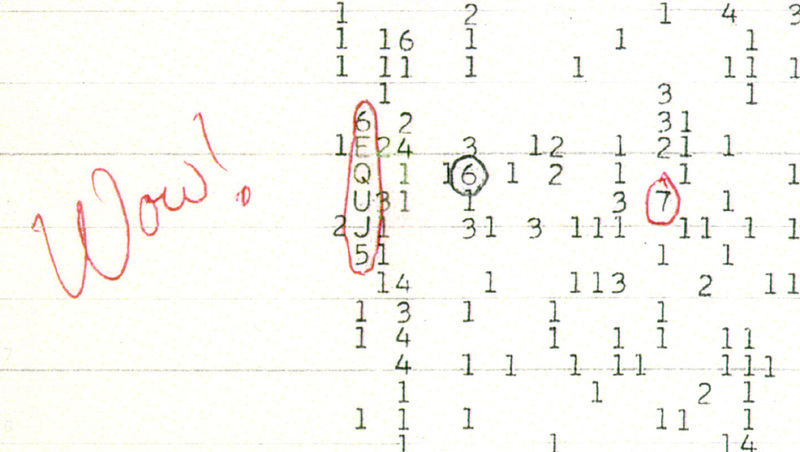 "6EQUJ5 was code describing a radio signal that had come in three days previously, on August 15, 1977. Ehman saw that the Wow! signal, as it has come to be known, was strong, covered a narrow range of wave­lengths, and lasted 72 seconds, as would be expected from a deep-space source. (This was the length of time that the Big Ear could observe a distant cosmic target, before Earth's rotation rolled another patch of sky into view.) All of these characteristics were consistent with a transmission from an alien civilization. The original printout with Ehman's handwritten exclamation is preserved by Ohio History Connection. "This was very intriguing indeed, but astronomers would need more information before they could say anything definitive about the Wow! signal. For starters, they'd need to observe it again. So Ehman and his col­leagues tried with the Big Ear, again and again. Nothing. Other astronomers sought to pick it up as well, using a variety of different scopes. Silence. Researchers have continued this effort over the decades, and nobody has had any luck. The Wow! signal was a one-off, a single cry in the dark.
" 'I don't think it can ever be determined,' Ehman said.
" 'I'm frustrated that I can't draw any further conclusions than I already have.'"